City: 19 – Hwy: 27	Actual rating will vary with options, driving conditions, habits and vehicle condition. CLEAN CARFAX, PORSCHE DOPPELKUPPLUNG (PDK), SPORT CHRONO PACKAGE, PREM PKG PLUS W 14-WAY SEATS, 20-INCH CARRERA CLASSIC WHEEL, SPORTDESIGN STEERING WHEEL, PORSCHE ENTRY & DRIVE, CLEAR BRA, NEW MICHELIN PILOT SPORT 4S TIRES, SEAT HEATING (FRONT), SEAT VENTILATION (FRONT), BOSE(R) SURROUND SOUND SYSTEM, SIRIUSXM(R) & HD RADIO(R) RCVR, 6-DISC CD/DVD CHANGER, PORSCHE DYNAMIC LIGHT SYSTEM, CABRIOLET ROOF IN BLACK, AUTOMATICALLY DIMMING MIRRORS, POWER SPORT SEATS (RIGHT), POWER SPORT SEATS (LEFT), WHEEL CAPS COLOR PORSCHE CREST, LIGHT DESIGN PACKAGE, PARKASSIST (FRONT AND REAR), POWER STEERING PLUS, ELECTRIC FOLDING EXT. MIRRORS, BLACK STANDARD INTERIOR, AGATE GREY METALLIC, POWER SPORT SEATS (14-WAY), PORSCHE CREST ON HEADRESTS, HEADLAMP CLEANER EXTERIOR COLOR!! This car has been inspected by our certified technicians and is ready to drive home. Upgrades are available at RAC Performance. TUNES, EXHAUST, WHEELS, TIRES and MORE! Contact our professional sales staff at 214-269-1570 for any questions or additional information. We also offer competitive finance rates as low as 3.9%. We hand pick only the finest automobiles to sell and every vehicle gets a rigorous internal inspection by our certified technicians. 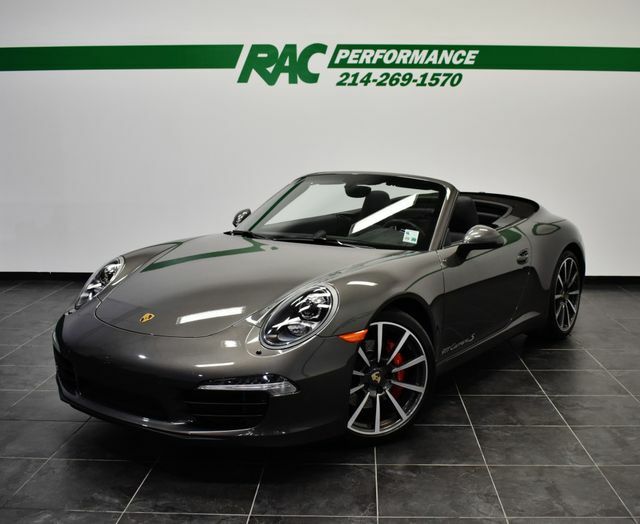 At our 9000 square foot state of the art facility, RAC Performance offers service on Porsche, RUF, Ferrari, Maserati and Lamborghini models. We offer dealership quality service and repairs at competitive prices and only sell the finest vehicles! RAC Performance cannot guarantee the availability of vehicle books/manuals, additional keys, or additional accessories with vehicle purchase, unless otherwise stated in the vehicle description or by an RAC sales professional. Stop by and check out our state-of-the-art Service Department, Performance Shop and Huge 32,000 square foot Indoor Showroom! We facilitate door-to-door shipping to anywhere in the world at an affordable price.